This was a personal pick of mine for my babies. The main reason why I believe you might also want this is the myriad of nifty features that it comes with. This baby mobile doesn’t just spin around and produce gentle lullabies, it also comes with several musical choices. You get to choose from several classical kinds of music to soothing ambient sound like crashing waves of the ocean and various nature sounds to name a few. The large, brightly-colored, and friendly looking animal characters. You can also give your baby a nice little light show on the ceiling thanks to projector located at the top of the device. It also comes with remote control features so I never had to distract my baby by entering the room. Personally, I would recommend this baby mobile due to its features and the decent price tag. Easy and secure to attach to the crib or canopy. Comes with a remote control so that you can operate it without distracting your baby. It features four child-friendly animal characters, a projector, and a music player with a dozen tunes to choose from. It has an auto-off feature and will turn off after 22 minutes. If your infant takes longer to fall asleep, then this is a bit of a downside. The music volume is a bit low. But at least it won’t clog the sound of your baby monitor if you have one. A great alternative that is equally as good would be the Tiny Love Take Along mobile. However, its strengths lie elsewhere. Rather than delivering a handful of cool features, it focuses on versatility and durability. This is my go-to baby mobile for when we will be going on a relaxing family trip. It is incredibly compact and lightweight. It is also surprisingly durable. The all-purpose clamp means that all you need is a sturdy place to attach this baby mobile and you’re all set. It is a standard baby mobile in itself, it comes with brightly colored animal characters while the main device plays soothing tunes to entertain and calm your child. If you need an extra baby mobile for when you are traveling with your little angel then this might be a solid choice. Comes with an all-in-one connector for different types of surfaces. It can practically attach to anything sturdy. The compact and sleek design makes it easy to bring along anywhere. The mobile can play melodies for 30 minutes. The mobile arm is rather short. I believe this baby mobile was specifically designed for travels and baby canopy use. If you need something budget-friendly, then the Wimmer-Fergusson baby Mobile might be your cup of tea. One thing that I can point out about this baby mobile is that it appears not to soothe your baby but rather stimulate their cognitive abilities. This baby mobile doesn’t use colorful animal or cartoon characters. Instead, it utilizes highly contrasting colors and various patterns to stimulate and develop your child’s visual processing capabilities. Since the baby mobile uses flat cards with various patterns, it goes without saying that this one is easy to fold and store. That is also an advantage if you want to bring your baby outside for a nice stroll. 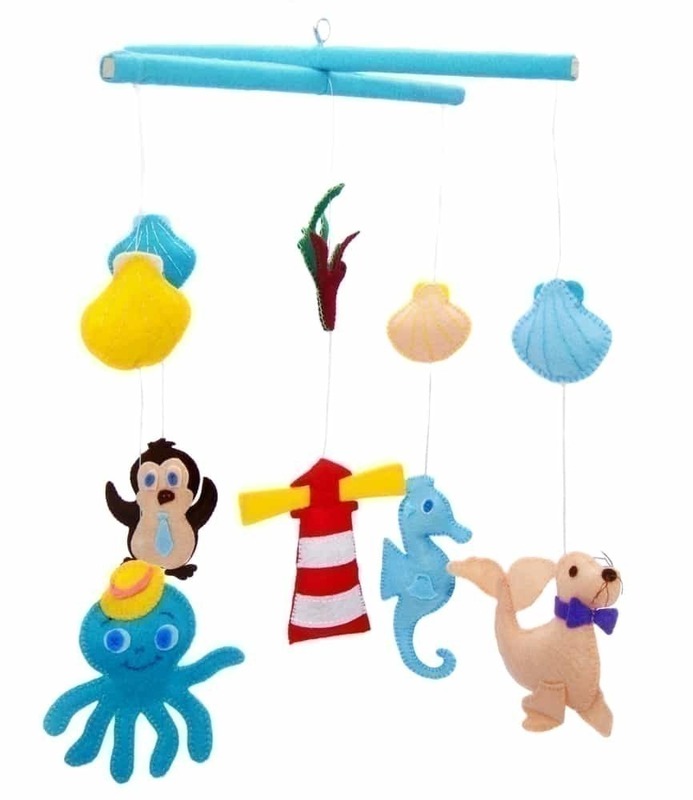 Great baby mobile for helping develop your child’s visual senses. It primarily utilizes visual stimulation, no melodies to clog up the child’s cognition. This is a great educational toy as well as it can help introduce your child to different colors. It is not exactly a soothing baby mobile as it is more of an educational one. So, it might not be the best choice if you’re trying to make your baby fall asleep. If you want to go all in with your baby mobile, the Fisher-Price Smart Connect Deluxe Projection Mobile might be something you could be interested in. This baby mobile comes with your standard baby mobile functionalities with some nice additions to fully round out the experience. It features sensors that will notify you via smartphone if your child is crying or if there’s anything amiss with the sound inside your baby’s room. It’s like a baby monitor and a baby mobile combined into one convenient device. It also employs a nice projector that gives your kid a nice little light show. It uses a mobile app that you can download for free. This allows you to fully control and use all the important features that come with this baby mobile. The connector is also pretty sturdy and clamps down securely to the crib. It uses various animals that is great for learning as well. Smart app for iOS allows you to monitor the room and control the baby mobile. The volume of the music from the mobile is clear and just loud enough without startling the child. Designed to stimulate and soothe your baby. It uses batteries so expect to replace it regularly throughout its lifecycle. The app is responsive and work great with iOS but not so much with Android phones. The VicTsing Baby Mobile is a customization enthusiast’s dream come true. It’s basically just a rotary device, arm, and clamp. You get to decide what you will attach to the mobile. It’s affordable and you can fully personalize it to make sure your baby will have the utmost enjoyment with the mobile. I find this to be a cost-effective choice if you have a couple of small, child-friendly, and colorful animals in your home. You just tie a knot and attach them to the mobile. Again, this isn’t the flashiest baby mobile around but thanks to its full customization feature, it could be. Can be fully personalized with whatever plush toys you have at home. It uses a wind-up mechanism so no battery included. It’s a pretty bare bones baby mobile. No bells and whistles. As it uses a wind-up mechanism, the melodies, and the rotary device only spin for 3 minutes max. This one only includes the main baby mobile music box and does not come with an arm. It also does not come with the dangling plus toys so keep that in mind. This is basically just the musical box and rotary mechanism. That being said, I did enjoy that it includes 60 melodies of famous songs and classical music. This baby mobile music box pretty much helps remove the issue of playing the same couple of melodies for hours on end. It should also help introduce your child to some world-class music such as “Swan Lake” to Disney classics such as “Can You Feel the Love Tonight”. Also, each melody is one-minute versions of the originals. While the baby mobile will turn off automatically after 30 minutes, it will pick up where it left off when you turn it on again. Contains 60 1-minute versions of popular melodies from classical to film and even anime films such as Hayao Miyazaki movies. It is only the music box and rotary device. You will need to supply the arm and actual plush toys. Baby mobiles seems to be an easy enough product to buy, right? Well, it doesn’t hurt to get some information and learn the ups and downs of each product out there. It’s also important to have important factors that you should consider in order to make the most out of your purchase. 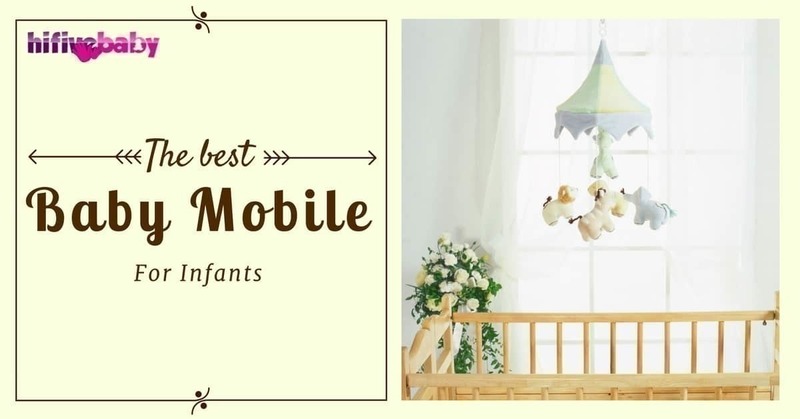 To help you find the right direction when choosing the best baby mobile for your child, I’ll give you the basics and the important factors you should consider. There are literally hundreds of toys hanging from baby mobiles. Some offer a theme like safari animals, aquatic species, or fictional characters. If your child is but an infant, anything brightly colored and eye-catching should suffice. If your child is at the stage wherein he or she is already playing with toys, then you might want to check their preferences before making a purchase. 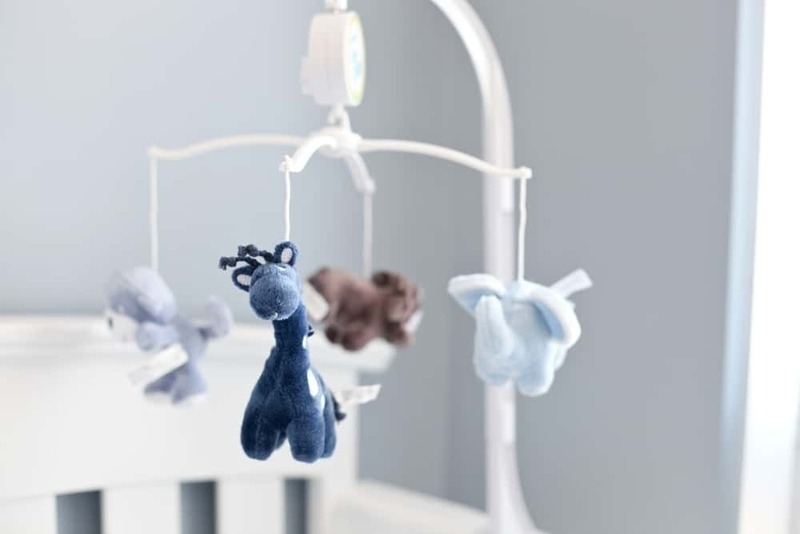 If your child loves dinosaurs you should get a baby mobile that has dinosaur plush toys dangling. Making sure that the baby mobile’s design fits with what your child loves will ensure your child will enjoy it 100%. This is vital before you purchase a baby mobile. The clamp or connector should fit perfectly with the crib your baby uses at home. The last thing you want is an ill-fitted baby mobile wobbling above your child. There are dozens upon dozens of cribs out there. It is important that a baby mobile can be easily adjusted to fit each and every possible crib design. If you have a unique baby crib, I suggest you check the manufacturer’s manual as it will most likely contain information about recommended baby mobile connectors. Don’t force a baby mobile if it’s incompatible with the crib. The baby’s safety is of the utmost importance in this scenario. The portable baby mobiles come in different shapes and sizes. They are mostly designed to be attached to cribs and baby canopies. Portable and compact designed means you can bring them during trips outside. Some will require adequate space to be used properly. Adjustable to get the best possible position depending on where you attached it. No issues regarding leaving holes on the wall during installations. Considerably more expensive than fixed baby mobiles. Some baby mobiles are too large and near to the child that they stimulate the baby further rather than relaxing them. This type of mobile is installed on the wall or ceiling using screws and hooks. It is pretty much designed to be installed in one specific place in the house and stay there. There are several key features that you should definitely take into consideration before choosing a baby mobile. Having all of these features in your baby mobile can ensure you get the most out of every penny and guarantee that your child will be entertained, stimulated, and relaxed. Melodies – It should be able to play music for, at the most, 30 minutes. Night Lights/Projector – This will act as both a night light and a form of stimulation for your child besides the hanging plush toys. Removable Plush Toys – You should have the option to detach the dangling toys on baby mobiles. Your child might find one the toys to be quite interesting and will surely try to get it. Having the toy detachable will prevent frustrations on the baby’s side. Remote Control Functionality – Sometimes, your baby will be half away asleep when the baby mobile stops moving or playing soothing music. Rather than going in there and manually turning it on again, which could distract your baby and make it more difficult for them to sleep, just operate it from a short distance. Each baby mobile is different just as each baby is different. You just need to know which one suits your child the most. Having a slew of products to choose from is both a blessing and a curse as it can be overwhelming. Overall, I would have to give the best baby mobile award to the Fisher-Price Precious Planet Baby Mobile. It checks out all of the important factors I listed above. It’s portable and easy to set up, it comes with removable hanging toys, music box, and a projector, and it’s reasonably priced. I don’t even think there is a baby mobile that can match up to it at the moment so expect the Fisher-Price to be a staple of the best baby mobile list all the way through 2018. If you have anything to add or any personal favorites in terms of baby mobiles, then feel free to share it with us down in the comment section. As always, proper information and knowledge are vital when it comes to products for our babies. Only the best and safest should be considered.